This past week the Poker Voters of America announced they had a new sponsor for their proposed legislation that would legalize and regulate intra-state online poker in California. It’s still unclear which State Senator will take up the cause now that pro-online poker Senator Rod Wright is embroiled in his own legal troubles revolving around perjury and voter fraud charges. 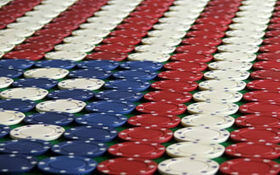 Nothing has been formally introduced at this time, a spokesman for the Poker Voters of America stated that they are “just ironing out a few details” before the bill is introduced into the California State Senate. California was one of the first states to test the waters with online gaming legislation, and despite a few near misses the state is still one of the most likely to legalize and regulate the industry –although New Jersey has surpassed California, and is the closest to enacting online gaming legislation. Should New Jersey’s online gambling pass –it now sits on the desk of Governor Chris Christie who has until March 3rd to make a decision—it’s likely many other states will follow suit, including California. This entry was posted on Sunday, February 27th, 2011 at 12:23 pm and is filed under Poker News. You can follow any responses to this entry through the RSS 2.0 feed. You can leave a response, or trackback from your own site.